Bard (n.) -- one who is a performer, tradition-bearer, historian, teacher, writer and newsbringer. 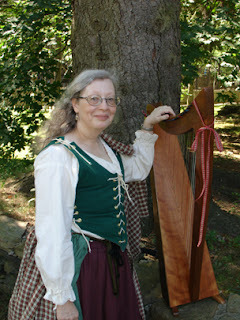 Whether performing solo or as a member of ClarSeannachie, the Harp Grove of Western PA, or Oran agus Sgeul / Song & Story, Barra will enchant you with tales of ancient Celtic heroes, heroines, and magic folk....and sometimes, the music of her harp, Dreamsinger. Barra has performed up and down the Eastern US from the shores of Lake Ontario to Daytona Beach in venues as varied as The Ligonier Highland Games, Lake Ontario Celtic Festival, Tellebrations, Pittsburgh Irish Festival, Smoky City Folk Festival, Burns Night Dinners, St Patrick's Day celebrations, St David's Day celebrations, holiday parties, bookstores, church programs, and a BMW bikers' rally,schools, colleges, and club luncheons. Ask Barra what is her favorite story is and she will tell you, "The one I just learned but haven’t had a chance to tell yet!" 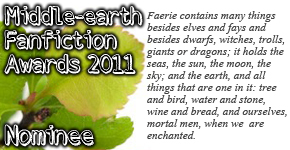 To my astonished delight, my serialized Middle-Earth fan fiction novel has been nominated for the 2011 MEFA Awards, the equivilant of Oscars for JRRT fanfic writers! Please see My Writings page for a link to it. Please check out my blog Adventures in Barding and you can also find me on Facebook. © Barra Jacob-McDowell 2011. Simple theme. Powered by Blogger.